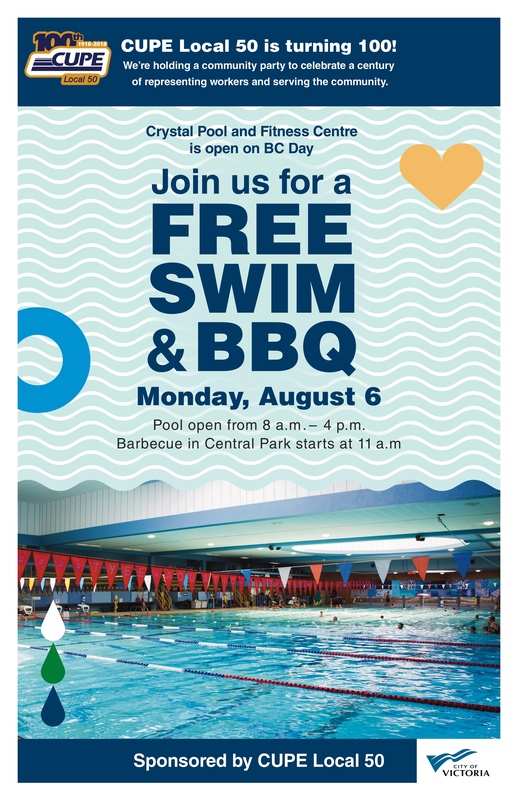 VICTORIA, BC – To celebrate 100 years of representing workers and serving the community, the Canadian Union of Public Employees (CUPE) Local 50 will be sponsoring a free swim and community barbecue on BC Day, Monday, August 6 at the Crystal Pool and Fitness Centre. Admission to the Crystal Pool and Fitness Centre will be free all day (8 a.m. – 4 p.m.) for all patrons. The free community barbecue will begin at 11 a.m. in Central Park. CUPE Local 50 members will be supplying and serving hot dogs and refreshments until supplies run out. “CUPE is a wonderful partner whose members are involved and engaged in making our city better each and every day through exceptional service delivery. We truly appreciate their generosity in hosting and sponsoring this event,” says City Manager Jocelyn Jenkyns. CUPE Local 50 is proud to sponsor the event and is covering the days’ operations, activities and refreshments.